Surprise ~ Art Fair Bird Prints!! My daughter is an incredible elementary school art teacher in New York City, and she puts on an awesome ART FAIR every spring featuring her students’ work. As always, the students take on various important roles, as gallery attendants, art-making station leaders, and hosts for countless family members and community visitors to the Art Fair. This year, a very special student volunteer was my Host – my own personal guide to the Art Fair. As we toured the bustling room full of exhibits and activity, my charming student host told me that I would soon be treated to one particular exhibit that would be a special “surprise”. . . . As I approached the documentation panel accompanying this exhibit, I immediately noticed something familiar . . .
What a delightful and totally unexpected surprise it turned out to be!! 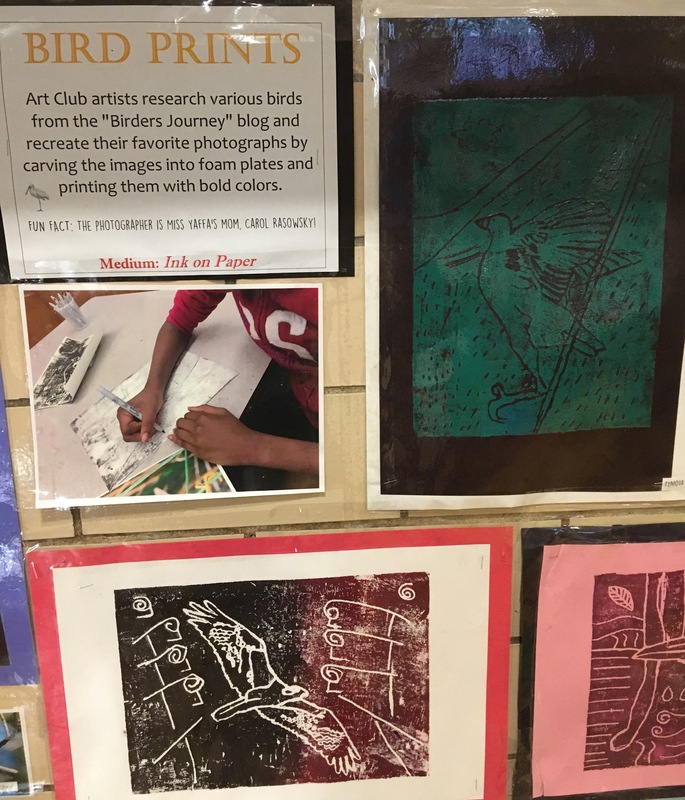 My daughter’s Art Club students had re-created some of my Birder’s Journey blog post photos into their own bold and beautiful color prints! Such talented and skillful students and such beautifully crafted prints! This entry was posted in Birds, New York. Bookmark the permalink. So true, AB!! She is a blessing in so many ways. And her students are so lucky to have her as their teacher!